A GAL NEEDS...: Let It Snow! I'm Warm With eShakti! Let It Snow! I'm Warm With eShakti! I swear I can't get warm during the winter months! The heater can be cranked up to 80 degrees and I'm still searching for my fuzzy slippers, my warmest sweats and my hoodie! In addition, 2 or 3 layered shirts will be underneath! So showing skin certainly isn't priority when I order or buy clothes for this time of year. I ordered this two-toned maxi tank dress from eShakti in November and now that it is December, I'm really glad I have it! 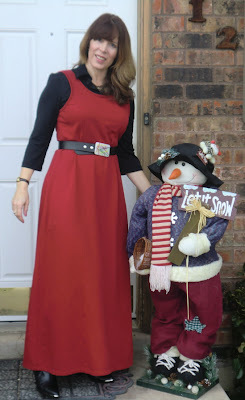 To me, it is warm fuzzies, hot chocolate and a cozy fire all made into a dress! I love how when I ordered, it came really quickly, even though it hails all the way from Korea! The material is sturdy and the inside is lined with fleece! Cold I am not when I wear this dress. This will be my go-to dress this winter! I liked how the measurements were easily modified to my exact specifications. I custom-ordered the length and the bust size. The dress is so comfortable because of that! At eShakti, they strive to make every customer look her best by making clothing to each individual specification. If that means adding a sleeve, collar or a few inches in length, then that is done. The only requirement is to know how many inches you'd like to add or take away! They will do the rest! They provide amazing style with a wide variety of fabrics and color choices in sizes 0-26! The fabric quality is above average and the prices are quite reasonable as well. As an example of the versatility of eShakti, let's take this Houndstooth print fleece knit dress below. It is made from the same warm material as my dress, super cute, but it has no sleeves. If I were to order this dress, I would want quarter-length sleeves. No problem! I would simply specify on my order that I'd like quarter length sleeves and also, while I'm at it, I'd like to add 3" to the length. Now, I've got the perfect dress for me! Maybe you would want it different! But that's the beauty of eShakti! I believe that a woman who wears and chooses eShakti is confident, caring, collected and classy! The eShakti Woman knows what company gives her the best possible fit and style. That company IS eShakti! Disclaimer: I was provided with product to provide an honest and fair review! This is my preliminary review for eShakti in anticipation of the blog event, Blogtastic, in which eShakti will be giving away a dress on this blog! Make sure to stop by then, starting January 18th! 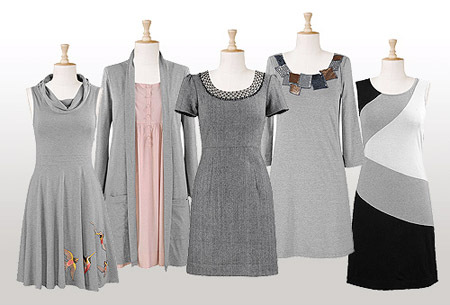 I love the eshakti gray pieces! I'm all about gray this season! Wow, I love that they let you make customizations. Their prices are not bad and the prices for customization are minimal. Very cool! I have seen several positive reviews of eshakti--first one on cjanerun and they all make me want to try them! Love eShakti, and the dress you picked is absolutely gorgeous! I really like this dress. I have read tons of great reviews on eShakti in the past year and have not had the chance to try out any of their items. But, I am thinking that this dress just might be a new "must" in my wardrobe! Thanks for sharing! I love how you can customize the measurements...I am a small girl but I am nursing right now so my bust-line is a lot larger than my waist and I cannot find anything that fits right! What I like about eshakti is that the clothing is fashionable, but modest. I LIKE the Tonal embroidered hem pants and the idea that they have custom styling. $7.50 is a GREAT!!! price for custom styling. How cute is the eShakti! Very elegant! Seriously, yours turned out great, I love it. I love their stuff! They've got this one dress that's got this miltary-jacket look to it. It's awesome! The dress looks great on you and I love that they have fast shipping all the way from another country! Awesome!